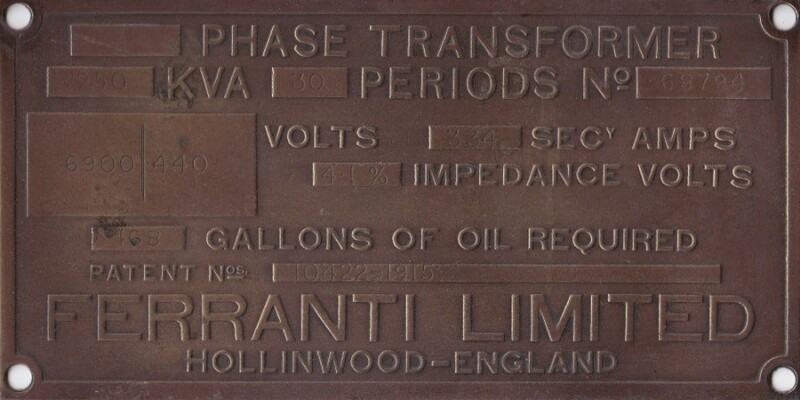 Two early switchgear name plates. Not sure of age but suggest 1930's-1940's. A couple of old switchgear plates rescued from old equipment in the Top Hards seam at Markham No2. The seam was worked out circa 1930's but was part of a two stage pumping system from No2 pit bottom via the Top Hards to the surface until No2 pit bottom installed more powerfull pumps which could pump direct to the surface. The seam was then used for garland water from the No's 2 & 3 shafts and water was syphoned into No2 pit bottom from here. The first Waterloo seam was opened up from this seam but was abandoned due to water problems as the drift ran downhill into the seam from here, so flooding was inevitable.